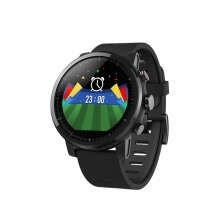 With a polished ceramic bezel, scratch-resistant 2.5D Corning Gorilla glass, the Amazfit Stratos Smart Sports Watch 2 is a premium multisport GPS smartwatch with 5 ATM water resistance, supports detailed sports and GPS tracking for lots of sports, Through a partnership with Firstbeat this watch also measures maximum oxygen consumption (VO2max), exercise load (TD) and recovery time. This rugged 5 ATM water resistant smartwatch features built-in GPS, GLONASS and optical heart rate sensor (PPG), a barometer for elevation measurement, WiFi, heart rate sensor and onboard music storage. Polished ceramic bezel, scratch-resistant 2.5D Corning Gorilla glass, stainless steel physical buttons for easy navigation and an exchangeable 22mm durable silicone watch strap. Automatically track your daily steps taken, distance traveled, calories burned, heart rate and sleep quality plus optional movement reminders. Sustainable use of 5 days, to avoid the trouble of frequent charging. In the GPS sports mode, continuous use time can be reached for 35 hours. With AMAZFIT Watch App 2.0, you can bind the watch, sync data, check out your daily activity data and sports records, set up various Widget sequences, import running track map data, and more in APP. Amazfit Stratos also features smart notifications for calls, messages, emails and other app notifications, weather forecasts, compass, alarm, and activity monitor. Compatible with the devices of iOS 9 and Android 4.4 and above. photographic angle and configuration of monitor. We will try our best to send the product with the illustrated color as possible.